Peter Tunstall’s obituary appeared in the ‘Dairy Telegraph’, 30th July, 2013, where he was described as ‘an inveterate escaper who spent longer in solitary confinement than any other allied POW’. Peter Tunstall was born on 1st December, 1918 in Heath Road, Chadwell – at that date a rural way through barley fields. After attending the Orsett C. of E. school, Tunstall was entered as a prep-pupil at Palmer’s, Grays from the age of nine in the autumn of 1927 and remained a day scholar there for the following decade. Tunstall’s enthusiasm for aviation was evidently encouraged and during his final year at Palmer’s his free time was devoted to flying lessons taken at the Maylands airfield, Upminster. He was granted a short service commission in the Royal Air Force in 1937. After the declaration of war, Tunstall flew Hampden bombers with 61 Sqdn. He and his crew were captured when his aircraft would be forced to ditch on a sandbank in Dutch waters. 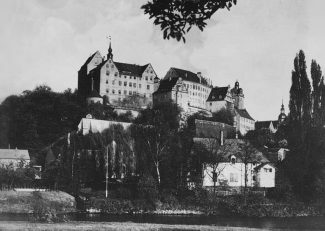 He fought his own individual campaign against the captor-authority and was subsequently sent to Colditz. His contribution to the sending of coded intelligence messages between Colditz and MI9 at the War Office by means of ordinary prison mail, was an aspect of his captivity for which he later expressed considerable pride, feeling it to have been of more real importance than the disruptive episodes by which he had become renowned. Peter Tunstall was twice married and had two sons and two daughters. He died at Knysna, South Africa on 27th July, 2013, aged 94.